A walk up the distinctive Colmer’s Hill and a pootle around Symondsbury makes an enjoyable local trip from West Bay. Colmer’s Hill is highly visible when you visit Bridport. Look down West Street from the Town Hall and there it is, a backdrop to the street view. For locals travelling back to Bridport the sight of it is simply a sign they are home. It’s a pretty little hill almost 100 metres above sea level, rising above Symmondsbury Village on the western edge of Bridport. It has a symmetrical cone shape and is topped with a distinctive copse of pine trees. Its name was originally Sigismund’s Berg, after a Viking chieftain, Berg being Norwegian for hill. Sigismund landed with a raiding party near Bridport during the Viking invasions. It is said that the beacon at the top of the hill was burning at the time. Sigismund’s Berg merged over time into Symondsbury, giving its name to the nearby village. The name Colmer’s was given much later in the 19th century, named after the Reverend John Colmer. He was the landowner and local rector of Symondsbury from 1805-06. The Colfox family, whose lands still include the hill, planted 21 Scots pines at the top in 1918 to commemorate local people who died in the First World War. Less than half of the original trees are left now. A few years ago a ring of Monterey pines were planted, so pine trees will always be there. Many artists and photographers have been drawn to Colmer’s Hill. The light constantly changes the hill’s appearance. It is often surrounded by a mist in the early morning or backed by a sunset in the evening. In early summer the southern facing side is covered with bluebells. In late Autumn the bracken becomes golden. 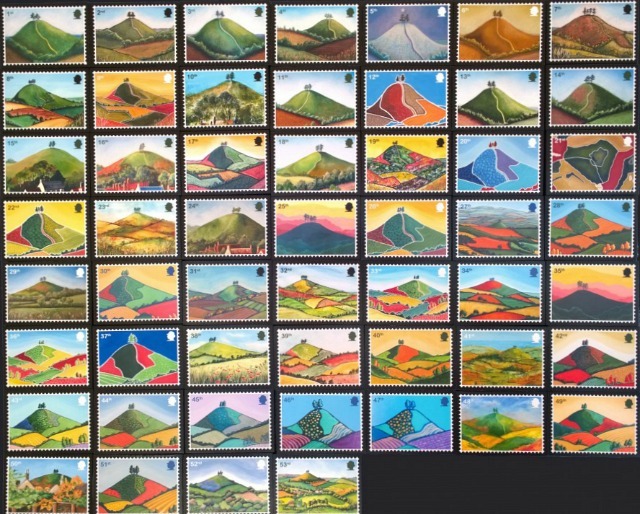 Local artist Hilary Buckley has produced 53 different paintings to date of Colmer’s Hill with many available to buy as prints. 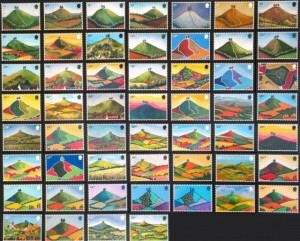 Here is a block stamp print put together of all her paintings of the hill. Marion Taylor, another local artist, compiled a book of several artists’ pictures of the hill. The walk up Colmer’s Hill is short and quite steep (but not as steep as East Cliff!). It gives you a great view from the top. The first time for us was on a very cold Boxing Day several years ago when we all felt the need for a little exercise after the usual Christmas overindulgence. This fitted the bill perfectly. The picture at the top was taken that afternoon. The wintery setting explains the lack of colour in a scene which is often such a vibrant inspiration to artists and photographers! From West Bay it is about a ten minute drive to Symondsbury. Go left at The Crown roundabout. After about 3 minutes, at the summit of the A35 incline, turn right (B3162). Once off the A35 immediately turn left signed towards Symondsbury and the Ilchester Arms. Colmer’s Hill is clearly visible. In the centre of the village look for parking to the left of the Church (or park in Manor Yard, see below). The public footpath route is straight on up this lane and takes you around to the far side of Colmer’s Hill before climbing on it. There is also a well worn permissive path bearing left past a few garages in about 100 meters from the main road. Having reached the trig point at the summit you will be rewarded with the grand views of the coast and rural landscape. A great spot for a photo. The public footpath continues West on to the knobbly top of Quarry Hill. This hill has views towards Chideock and Seatown and Colmer’s Hill itself. Symondsbury is an ancient, pretty village with a church, village school and country pub. Manor Yard, part of the Symondsbury Estate, contains several shops, artisan workshops and a cafe centered around a lovely tithe barn which dates back to the 14th Century. The cafe, Symondsbury Kitchen, serves breakfast, lunch and a selection of cakes and coffee. Surely you deserve a slice of cake after your climb? One of the shops in the yard, Bridport Cycles, hires out bikes and there is an 8 km bike trail from the yard around the estate. The pub, The Ilchester Arms, is a 16th century village inn with oak beams and a huge open fireplace in the bar area. We’ve not eaten there but we do know they stock Palmers ale. Good if you are a little parched after your walk! You can also set off from Symondsbury to walk down the mysterious holloway mentioned here. There’s a network of these secret tracks between Symondsbury and North Chideock. Did you see the series on ITV last year called Best Walks With A View with Julia Bradbury? In one episode she was in West Dorset on a Golden Cap walk. She started inland in Symondsbury and from there walked off down a footpath, a Dorset holloway. The name holloway name comes from the Old English “hola weg”, meaning a sunken road. Over hundreds of years the wearing action of feet, cartwheels and rain have deepened sandy tracks in the soft sandstone rock in South Dorset, gouging paths into the bedrock itself and creating deep ditches. Long since abandoned as thoroughfares, and overgrown with brambles and bushes, the paths are often now unknown to all but locals. 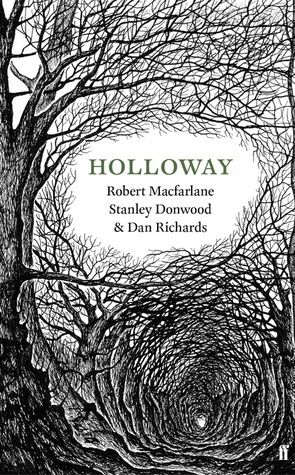 The author Robert Macfarlane has written about them in his book Holloway. Stanley Donwood illustrated it. He is best known for his work on Radiohead albums. The holloway near Symondsbury was probably a drove trail used to move cattle and other animals from farms to markets or perhaps a pilgrimage route. It’s likely that heavy carts took stone along it to Symondsbury from the local quarry. Maybe smugglers, having taken their contraband up from Seatown beach, used the sunken lane to surreptitiously transfer goods inland? We decided to go and walk the holloway ourselves. With Shutes Lane it connects Symondsbury with North Chideock. We parked in Symondsbury, climbed up and back down Colmers Hill, and then walked out of the village. For a while our path was just an ordinary country lane but then the greenery thickened. Soon steep walls of rock towered above us on both sides. We continued our walk through what was now a narrow gorge. Gnarled tree roots were exposed out of the rocks, ivy trailed down. Trees above us filtered the light making it felt at times as if we were travelling down a tunnel. Over countless years many passersby had stopped to etch messages, names, faces, giant eyes and other shapes into the rocks. Were we imagining it or did the atmosphere feel a little sinister as we continued along the shadowed path? The name of it did nothing to dispel this vague sense of unease… Hell Lane. I wonder why it is called that?